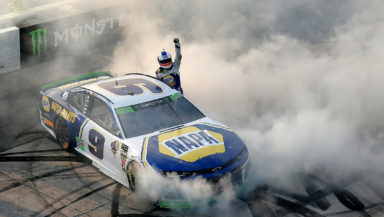 Chase Elliott wins the Gander Outdoors 400 at Dover International Speedway after a thrilling final 10 laps to advance to third round of playoffs. “Just perseverance and good adjustments throughout the day. It was just a great effort. I appreciate everybody and all my partners, NAPA, Valvoline, Hooters, SunEnergy1, Chevrolet, Mountain Dew, and Kelley Blue Book. It’s been an up-and-down year, I feel like. To have this race slip away last year makes the day that much more sweet.” Elliott said. Kyle Busch started on the pole for Sunday afternoon’s race since qualifying was rained out on Friday. The top 12 cars were playoff drivers. It was rough early on for Jimmie Johnson. He was not able to start the race because he had a lower ball joint failure. He joined the field on lap 10. Kevin Harvick took the lead from Kyle Busch on lap 14. He was able to extend his lead pretty good early on in the race. On lap 73, leaders started to make green flag stops. The pit cycle resulted in Joey Logano passing Kyle Busch and Ricky Stenhouse Jr. taking the lead because he did not pit. Things got worse for Jimmie Johnson after getting penalized for pitting outside the box. His day went from bad to worst. Harvick was able to retake the lead from Stenhouse Jr. on lap 82 when Stenhouse went to pit. Harvick won Stage 1. Only 14 drivers were on the lead lap by the end on Stage 1. Alex Bowman was able to pass Paul Menard to reclaim the free pass position. Joey Logano rolled out the pits ahead of Harvick during the stage caution. Harvick was able to retake the lead from him on the restart. Chase Elliott was penalized for an uncontrolled tire during his pit stop. He then went in the pits to pull out a fender. Clint Bowyer started to show some speed in Stage 2. He was able to move himself into 2nd after passing Joey Logano on lap 159. He slowly started to crack down on Harvick’s lead. After green flag pit stops during Stage 2, Kevin Harvick was able to retake the lead. Going into lap 200, he had led 167 laps. It had been a dominating race for Harvick going into the final stage. Things got a little dicey for him when he was trying to lap Alex Bowman. He made some contact with Bowman before putting him a lap down. This battle gave Bowyer an advantage to reach Harvick’s tail. Harvick won Stage 2. Aric Almirola started to make a run up front as he was able to take 5th place from his teammate Kurt Busch near the end of Stage 2. Kyle Larson was penalized for speeding in the pits putting him a lap down and in 17th for the restart. It is not the run Larson wanted as it is looking like he is going to need a win to advance to the next round. Harvick was the leader for the restart to start the final stage. He was able to jump in front of Bowyer and extend his lead right away. There was a point in the race where Stewart-Hass Racing took the top four positions. The first two stages were caution free other than the end of the stage cautions. Problems for Denny Hamlin occurred when he reported he had a loose wheel. Also, on lap 314 Stenhouse Jr. hit the wall but no caution came out. Drama began in the final 100 lap. As the green flag pit stops started Kyle Busch was penalized for being too fast. Harvick had to take his car back to pit road on lap 321 because he felt that he had a loose wheel. The lead was then handed to Almirola and Harvick ended up in the 14th position after his unscheduled stop. A caution came out on lap 338 for debris and Harvick was in position for the free pass. The cars came to pit road during the caution and Brad Keselowski took two tires giving him the lead for the restart. Martin Truex Jr. was hit with a speeding penalty as well as for Johnson. It was a race that Johnson will want to forget. Almirola took the lead from Keselowski on the restart on lap 348. The two tires for Keselowski obviously didn’t work as he lost a couple more positions. Harvick was able to take a lot of spots back after he restarted 13th. Elliott made contact with Bowyer giving him the fourth position on lap 356. Bowyer had a flat tire go down on lap 381, this was a huge moment for him as he fell out of the top eight in the playoff standings as a result. With less than 15 laps, Kurt Busch was able to get under a second of Almirola’s lead. The lapped cars were making a big impact in the battle for the lead until a caution came out after Bowyer slammed the wall on lap 392. Harvick was able to make it to fifth during the run. New leaders emerged when Almirola gave up the lead after electing to pit during the caution. Elliott and Keselowski lead the field to the restart on lap 396 and then Almirola got involved in a big wreck with Keselowski also taking Bowman with them. These were all playoff drivers involved. “The No. 2 (Brad Keselowski) kind of got tagged and started wrecking. I thought he was going to get to the bottom of the race track faster than he did. Dover is typically so self-cleaning, but he slid a little longer than I thought he would and I kind of just center-punched him. Watching the replay there was really nowhere to go.” Bowman said. Overtime was in affect at the end of the race when Elliott led the field for the restart securing his ticket to the round of 8. Almirola, Bowyer, Larson and Bowman are all under the cutoff in the playoff standings heading into Talladega. The Monster Energy NASCAR Cup Series season continues next weekend at Talladega Superspeedway for the 1000blubs.com 500 at 2:00 p.m. ET on NBC, MRN and SiriusXM NASCAR Radio.